Mainz vs Bayern kicked off the Fassenacht season in the Rhineland-Palatinate. But Bayern were there to spoil the party and did just that with a 2-0 victory. Frank Ribéry scores his 114th goal passing Mario Gomez. James with an absolute beauty. Bayern remain undefeated in the Rückrunde. Bayern started this game with a bit of an experimental line-up starting Rafinha, Juan Bernat, Sebastian Rudy, Corentin Tolisso and Sandro Wagner. No surprise that the Rekordmeister started a bit patchy against an organised Mainz side that sat deep trying to hit Bayern on the counterattack. It took about 20 minutes for either side to create any chance with Mainz getting the first look at goal after Jean-Philippe Gbamin found Alexandru Maxim on the left wing and the Romanian managed to break into the box facing goalkeeper Sven Ulreich the midfielder tried to score with a curling effort that just about missed the target. Bayern struggled to break down a defensive-minded Mainz side that was happy with hanging on to a 0-0 draw as long as possible. 30 minutes into the game Bayern had 71% ball possession, but neither side had managed a shot on goal at this point with Maxim’s shot, which missed the target, being the only shot recorded from inside the box at this point. All of that made the game a highly tactical match at this point with both teams at a stalemate until Frank Ribéry scored a beautiful goal to break the deadlock. The Frenchman scored in the 33rd minute with a dropkick from outside the box after Mainz failed to clear a corner kick. Just before halftime, James Rodríguez sealed it for Bayern. Corentin Tolisso with an inch-perfect cross from the half field that found James just outside the six-yard box and the Colombian brought the ball down with his chest and then volleyed the ball into the net leaving Mainz keeper Robin Zentner no chance. It was a fantastic finish by a Bayern side that left Mainz with no chance in the first half, and the Rekordmeister deservedly led the game after 45 minutes. The second half started with both teams playing free-flowing football. Sandro Wagner almost had a third for the Bavarians. Once again it was James, who instigated the chance putting a ball through to Sandro Wagner inside the box and the German national team forward turned quickly firing off a shot that Zentner had to do well to stop. Bayern continued the pressure and created further chances inside Mainz’s box from the getgo with Tolisso, James and Wagner all failing to score in the first five minutes of the second half. Mainz in the meantime was not without chances themselves with Giuli Donati spotting Robin Quaison in the 52nd minute just outside the box, the Swede led a shot fly from outside the box, and an outstretched Ulreich had to do well to tip the ball onto the crossbar. Mainz continued to look for that lifeline without getting through Bayern’s defence. The Bavarians continued their patient play, looking for a third goal that would have killed off things completely. In the 70th Müller should have had a third after he escaped Mainz’s defence and a spread out Zentner had to do well to keep the ball out of the net. Meanwhile, Quaison should have had one back four minutes later for Mainz, the Swedish forward escaped his defenders on the right edge of the box, and his shot beat Ulreich, but just missed the goal by one inch at the far post of the goal. The chances set off an exciting end to the game where both sides tested each other frequently trying to find a third goal on each end. 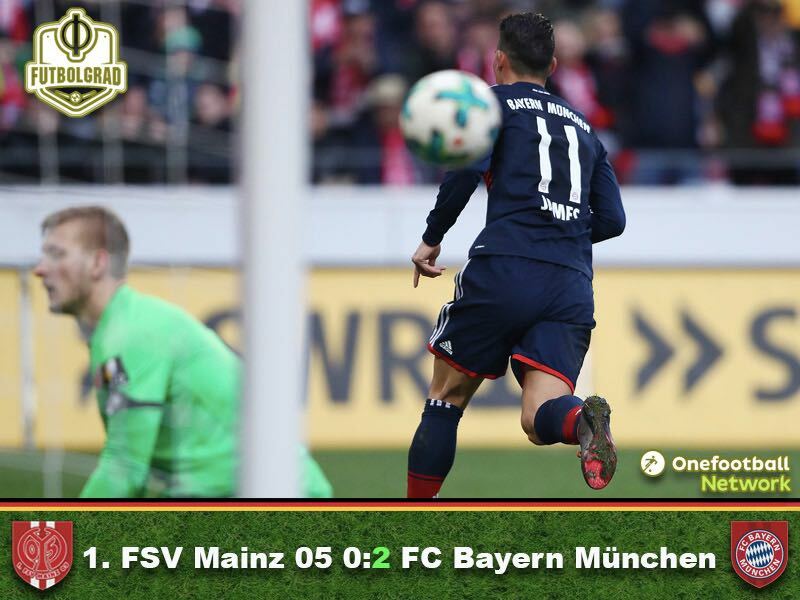 The open flow of the game should have favoured Bayern, and one would have expected that they would have scored one or two more goals in the second half, but with both sides being wasteful with their chances the game ended in a deserved 2-0 victory for the Rekordmeister. James Rodríguez was the man of the match. The Colombian once again was an inspiration when it came to Bayern’s attacking play. The midfielder played 73 accurate passes (84.9%) and was at the centre of every single Bayern attack acting like the playmaker, who dazzled the world at the 2014 FIFA World Cup. Speaking of impressing James goal to make it 2-o was sublime, and with the World Cup coming up soon the globe can be excited that one of the most talented players on the planet is once again in great form. Sandro Wagner got the start for Bayern München, but the forward struggled to replace Robert Lewandowski. The self-declared best forward in Germany was taken off in the 63rd minute after failing to impress. The national team forward seemed frustrated with his display as well, and with the World Cup coming closer and closer some might wonder whether his move to the Rekordmeister was the right choice after all. Ribéry has scored his 114th goal in competitive games for Bayern and passed Mario Gomez (113) – only ten players scored more often since Bayern are members of the Bundesliga. James has scored the 14th goal in the second half of the season for Bayern—only in 1983-84 have they scored more often (18) at this point of the second half of the season.